Not to be confused with Indie pop. Indian pop music (Hindi: हिन्दुस्तानी पॉप संगीत; Urdu: ہندوستانی پاپ), also known as Indi-pop, Indipop, I-pop, Hindi-pop, or Hindipop, refers to pop music produced in India that is independent from filmi soundtracks for Indian cinema, such as the music of Bollywood, which tends to be more popular. 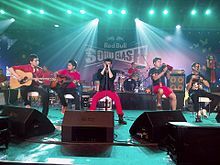 Indian pop is closely linked to Bollywood, Pakistani pop, Bangladeshi rock, and the Asian Underground scene of the United Kingdom. Pop music originated in the South Asian region with the playback singer Ahmed Rushdi's song ‘Ko Ko Korina’ in 1966 and has since then been adopted in India, Bangladesh, and lately Sri Lanka, and Nepal as a pioneering influence in their respective pop cultures. Following Rushdi's success, Christian bands specialising in jazz started performing at various night clubs and hotel lobbies in Karachi, Hyderabad, Mumbai, Delhi, Kolkata, Dhaka and Lahore. They would usually sing either famous American jazz hits or cover Rushdi's songs. Pop music began gaining popularity across the Indian subcontinent in the early 1980s, with Pakistani singers Nazia Hassan and Zohaib, forming a sibling duo whose records, produced by the Indian Biddu, sold as many as 60 million copies. Biddu himself previously had success in the Western world, where he was one of the first successful disco producers in the early 1970s, with hits such as the hugely popular "Kung Fu Fighting" (1974). The term Indipop was first used by the British-Indian fusion band Monsoon in their 1981 EP release on Steve Coe's Indipop Records. Charanjit Singh's Synthesizing: Ten Ragas to a Disco Beat (1982) anticipated the sound of acid house music, years before the genre arose in the Chicago house scene of the late 1980s, using the Roland TR-808 drum machine, TB-303 bass synthesizer, and Jupiter-8 synthesizer. The launch of MTV India and Channel V in late 1990s gave a huge push to India-pop music. It was this time when the music reached its greatest heights. Until then, few singers like Usha Uthup, Sharon Prabhakar, and Peenaz Masani outside it were popular. Since then, pop singers in the latter group have included Daler Mehndi, Baba Sehgal, Alisha Chinai, KK, Shantanu Mukherjee a.k.a. Shaan, Sagarika, Colonial Cousins (Hariharan, Lesle Lewis), Lucky Ali, and Sonu Nigam, and music composers like Zila Khan or Jawahar Wattal, who made top selling albums with, Daler Mehndi, Shubha Mudgal, Baba Sehgal, Shweta Shetty and Hans Raj Hans. Besides those listed above, popular Indi-pop singers include Gurdas Maan, Sukhwinder Singh, Mohit Chauhan, Papon, Zubeen Garg, Raghav Sachar Rageshwari, Vandana Vishwas, Devika Chawla, Bombay Vikings, Asha Bhosle, Sunidhi Chauhan, Anushka Manchanda, Neha Bhasin, Bombay Rockers, Anu Malik, Jazzy B, Malkit Singh, Raghav, Jay Sean, Juggy D, Rishi Rich, Sheila Chandra, Bally Sagoo, Punjabi MC, Bhangra Knights, Mehnaz, Sanober and Vaishali Samant. In the late 2000s, Indi-pop music faced increasing competition from filmi music. Major pop singer stopped releasing albums and started singing for movies. Recently, Indian pop has taken an interesting turn with the "remixing" of songs from past Indian movie songs, new beats being added to them. ^ a b "Channel V and MTV create never-before market for global music". India Today. 15 November 1996. ^ PTI (18 November 2015). "Death Anniversary of Ahmed Rushdi". Duniya News. Retrieved 2011-03-04. ^ "The Express Tribune, Remembering Ahmed Rushdi". Archived from the original on 27 April 2010. Retrieved 28 December 2012. ^ PTI (18 November 2005). "NRI TV presenter gets Nazia Hassan Award". Times of India. Retrieved 2011-03-04. ^ Geeta Dayal (6 April 2010). "Further thoughts on '10 Ragas to a Disco Beat'". The Original Soundtrack. Retrieved 3 June 2011. ^ "Music man with a golden touch". The Hindu. December 9, 2002. ^ "Young Tarang". Rediff. Retrieved 28 November 2017. ^ "Daler Mehndi". In.com. Retrieved 2014-02-22. ^ Booth, Gregory D.; Shope, Bradley (2014). More Than Bollywood: Studies in Indian Popular Music. Oxford University Press. p. 151. ISBN 9780199928835. ^ a b c d e "Statistics". Abrar-ul-Haq Official Website. Retrieved 26 March 2009. ^ "Abrar Ul Haq is back with a bangra". The Express Tribune. 29 April 2016. ^ "Disco Deewane, Nazia Hassan with Biddu and His Orchestra". La Pelanga. 19 September 2010. ^ Wartofsky, Alona (13 July 2003). "Rap's Fresh Heir". The Washington Post. Archived from the original on 19 September 2012. Retrieved 23 May 2012. ^ "Pop no more". Hindustan Times. 2 October 2010. ^ Jeffries, Stan (2003). Encyclopedia of World Pop Music, 1980-2001. Greenwood Press. p. 35. ISBN 9780313315473. All of Chinai's previous success was eclipsed with the 1995 release of Made in India. A series of uptempo songs indebted to traditional Indian music but revealing a definite Western influence, the album reached #1 in the Indian charts and stayed there for over a year as it sold over 5 million copies. ^ Limca Book of Records. Bisleri Beverages Limited. 1999. ^ Sabharwal, Gopa (2017). India Since 1947: The Independent Years. Penguin Group. p. 304. ISBN 9789352140893. ^ a b Kumar, Raj (2003). Essays on Indian Music. Discovery Publishing House. p. 18. ISBN 9788171417193. ^ Bill Lamb. "Jay Sean". About.com. Retrieved 2009-12-14. ^ "Punjabi pop hits the jackpot!". The Tribune. 19 February 2000. ^ a b "T-Series". YouTube. T-Series. Retrieved 19 April 2019.